Nine opera premieres and three premieres of the Ballett Zürich on the main stage as well as seventeen opera revivals and five ballet revivals are on the programme of the Opernhaus Zürich for the 2O19/2O season. Joining them are a premiere by the International Opera Studio at the Theater Winterthur, a new production of the series Junge Choreografen on the Studio Stage, nine concerts by the Philharmonia Zürich and the Orchestra La Scintilla, seven song recitals featuring operatic superstars, and a 20th anniversary opera ball, as well as numerous offerings for children, young adults and families – all told, around 350 individual events. The season is kicked off with a grand opening party and concludes with the traditional live broadcast of «opera for all». We are happy to deliver the new 2O19/2O season book to your home free of charge. Cecilia Bartoli has been a regular guest at the Opernhaus for over 30 years. A new production of Christoph Willibald Gluck’s «Iphigénie en Tauride» starring this exceptional artist is planned for the 2019/20 season, directed for the stage by Andreas Homoki. The first collaboration between the two will be musically directed by Gianluca Capuano, who appears with the Philharmonia Zürich. The Opernhaus Zürich commissioned a work by the young Swiss composer Stefan Wirth. Beginning in May 2020, this new opera «Girl with a Pearl Earring» will be presented to the public. The plot of this world premiere revolves around the creation of one of Jan Vermeer’s paintings. It is based on the bestselling novel by Tracey Chevalier, which also formed the basis for the film featuring Scarlett Johansson and Colin Firth. Thomas Hampson returns to Zurich to star as the painter. Joining him for this ambitious project are Felicity Palmer, Laura Aikin, and the young American singer Lauren Snouffer. The season’s first premiere features a 337-year old femme fatale. Evelyn Herlitzius makes her first appeareance in a new production at the Opernhaus Zürich, in «Die Sache Makropulos» by Leoš Janáček. Dmitri Tcherniakov will direct the opera for the stage. One of the most beloved operettas of all time is Emmerich Kálmán’s «Csárdásfürstin». Annette Dasch and Pavol Breslik take to the stage for this operetta, conducted by Ulf Schirmer, Intendant and GMD of the Oper Leipzig. Jan Philipp Gloger will direct for the stage. Richard Strauss and Hugo von Hofmannsthal’s final collaboration, «Arabella», is a mixture of Viennese operetta cheer and melancholic farewells. Julia Kleiter, Julie Fuchs, and Josef Wagner debut as Arabella, Zdenka, and Mandryka, respectively. Robert Carsen directs this romantic comedy of manners. GMD Fabio Luisi will personally take care of the both lively and refined Viennese waltzes. The coming season’s final premiere is also the first joint work for Fabio Luisi and director Calixto Bieito in Zurich. 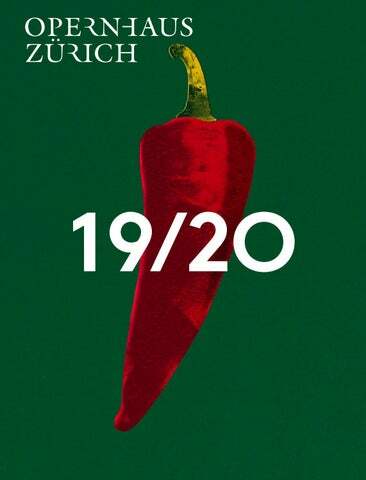 Verdi’s rarely-performed «I vespri siciliani» will premiere in June 2020 as a part of the Festspiele Zürich. Maria Agresta and Quinn Kelsey, making his debut in the Opernhaus Zürich, will sing the starcrossed lovers at the center of the opera, which takes place amid the milieu of Sicilian resistance fighters. Christof Loy’s next project in Zurich is Donizetti’s «Don Pasquale», with Johannes Martin Kränzle returning to the city on the Limmat in the title role. Julie Fuchs appears as the clever widow Norina, and Edgardo Rocha plays the old Don’s nephew. Enrique Mazzolla leads this musical masterpiece of comic opera. The young, up-and-coming singers of the International Opera Studio will present themselves at the Theater Winterthur in April 2020 with Joseph Haydn’s «Il mondo della luna». named Gerhaher Singer of the Year for his Zurich interpretation of the role of Wozzeck, for which he returns. Saimir Pirgu is Faust, Anita Hartig is Marguerite, and Ildebrando d'Arcangelo is Méphistophélès in Gounod’s setting of Goethe's human drama. Luca Pisaroni and Jane Archibald return as guests in «Don Giovanni». Catherine Naglestad (Abigaille), Dalibor Jenis (Nabucco) and Vitalij Kowaljow (Zaccaria) will perform together in this revolutionary work in the opera repertoire. Plácido Domingo appears as the titular «Nabucco», fulfilling a wish of his to sing this role for his Zurich fans in a unique gala performance. Making their debut appearances at the Opernhaus Zürich are Andreas Schager as Florestan and Wolfgang Koch as Don Pizzaro. Together with Anja Kampe, they’ll appear in «Fidelio». Kwangchul Youn appears as Heinrich in Wagner’s «Lohengrin» and Jacquelyn Wagner bows as Agathe in «Der Freischütz». Kristina Mkhitaryan and Liparit Avetisyan make their house debuts as Violetta Valéry und Alfredo Germont, respectively. Both familiar and new faces will conduct the Philharmonia Zürich. Fabio Luisi, the Opernhaus Zürich’s general music director, will dedicate himself to the Verdi repertoire in the coming season, conducting his orchestra for the revivals of «Nabucco» and «La traviata». imone Young returns for Wagner’s «Lohengrin». Axel Kober, equally at home in German repertoire, interprets Weber’s «Freischütz». Markus Poschner is at the helm of Beethoven’s «Fidelio». Hartmut Haenchen makes his debut in the Opernhaus’ orchestra pit with Alban Berg’s «Wozzeck». Ryan McAdams also makes his debut at the Opernhaus Zürich with Gounod’s «Faust». Riccardo Minasi leads Mozart’s «Don Giovanni», Marco Armiliato heads up Puccini’s «La bohème», and Rossini’s «La Cenerentola»is in Gianluca Capuano’s charge. Ottavio Dantone leads the Philharmonia Zürich with the successful production of Putin-regime critic Kirill Serebrennikov, «Così fan tutte». The ballet opens the 2019/20 season – as has become traditional – with a world premiere by ballet director Christian Spuck. For the first time, Helmut Lachenmann’s musical theater piece «Das Mädchen mit den Schwefelhölzern», based on the tragic fairy tale by Hans Christian Andersen, appears on stage as a ballet. This new production, which also marks a Swiss premiere, combines dance, imagery, and song with Lachenmann’s fascinating music – and turns the main stage auditorium of the Opernhaus into a room of sound. The Ballett Zürich has previously presented multiple works by William «Forsythe», and the American choreographer is now the focus of a single evening. This homage is simply entitled Forsythe, and is made up of three seminal works by this innovator of dance: «The Second Detail», «Approximate Sonata» (presented in the new Paris version from 2016), and «One Flat Thing», reproduced. For the production of «Walking Mad», Hans van Manen returns to Zurich, bringing with him his Kleines Requiem, which was premiered by the Nederlands Dans Theater. Maurice Ravel’s Boléro, which lends its name to the evening, is the vehicle for the Ballett Zürich’s first performance by Swedish choreographer Johan Inger, which was also premiered by the NDT. The «Junge Choreografen» series brings with it an evening full of new works, with the dancers of the Ballett Zürich and the Junior Ballet in artistic charge of their own new choreographies. Two productions by Christian Spuck will be revived: «Messa da Requiem» and «Nussknacker und Mausekönig». Joining them is «Emergence», a double bill featuring choreography by Crystal Pite and duo Sol León & Paul Lightfoot, the ballet «Faust» by Edward Clug, as well as the Junior Ballett’s production of «Kreationen» by Filipe Portugal, Louis Stiens, and Goyo Montero. Beatrice Rana returns, continuing the Beethoven cycle with two concerts, under the music direction of Fabio Luisi. Gianandrea Noseda, who will take up the baton as GMD of the Opernhaus Zürich with the 2021/22 season, guests this season in a concert with works by Schubert, Tchaikovsky, and Mendelssohn. And for a program of works by Mahler and Mozart, Manfred Honeck is at the helm of the Philharmonia Zürich. Riccardo Minasi, an expert in historically informed performance practice, dedicates himself to the Orchestra La Scintilla. In a series of four different programs, they will present Haydn’s «Schöpfung», works by Jan Dismans Zelenka, and a program on the theme of «Echos». Lars Ulrik Mortensen guests with La Scintilla for Handel’s «Water Music». In the 2019/20 season, the Opernhaus Zürich will again present song recitals with star soloists: Angela Gheorghiu, Pretty Yende, Krassimira Stoyanova, Stéphanie D’Oustrac, Benjamin Bernheim, and Christof Fischesser, while Julia Kleiter and Michael Nagy will appear together in recital. Following the summer break, the Opernhaus presents its traditional Season opening party on September 21, 2019. The whole of the house will be filled with dancing for the Opera Ball on March 14, 2020, as it celebrates its 20th anniversary. And on June 13, 2020, Mozart’s «Don Giovanni» will be live broadcast on the Sechseläutenplatz for «opera for all».